The head of the UK’s Flight Safety Committee says that airlines and plane manufacturers are keeping safety training to an “absolute minimum” under pressure to keep their costs low. Dai Whittingham, head of the trade group, said the industry has “less desire to provide training”. Pilot training is in focus after the Boeing 737-Max Ethiopia Airlines flight 302 crashed, killing all 157 on board. Boeing said safety was its “highest priority”. The UK Flight Safety Committee consists of representatives from the world of aviation including major airlines, manufacturers and safety regulators. He said that if airlines wanted more training then they had to argue with their financial teams to get it signed off. Money was also an issue for the airplane manufacturers, according to Mr Whittingham. The Ethiopia Airlines crash was the second Boeing 737 Max 8 to crash in five months. A Lion Air flight in Indonesia came down in October last year killing all 189 people on board. Earlier this week, investigators in Ethiopia stated there are similarities between both crashes, but the world is now impatiently waiting for more details from the black boxes. Since the very first days after the crash, attention has been placed on the pilots and their training for the aircraft. There is no evidence that the pilots flying the Ethiopia plane lacked the required training, but the crash has reignited a debate about safety more generally across the industry. What do pilots say about the training they receive? Pilots are often reluctant to speak out on issues such as safety as they are often bound by contracts from their employees. There are, however, some in the industry who have voiced their concerns. Karlene Petitt has been a pilot for more than 40 years, and has trained pilots for 21 years for major American airlines. Ms Petitt has also just completed a PHD in airline safety. As part of the four-year research she surveyed more than 7,000 pilots about safety and training, guaranteeing them complete anonymity. “Based upon my research, I have identified that we have a problem with pilot training worldwide, and training is going in the wrong direction which will impact safety,” says Ms Petitt, who is based in the US. “Pilots are often required to teach themselves the aircraft systems. They learn on their own – with no ground school,” she adds. The requirements and standards for pilot training are set on a Europe-wide basis by the European Aviation Safety Agency (EASA). These exceed international requirements. Three of the UK’s biggest airlines were approached for comment, but did not want to discuss airline safety. Why is training sometimes not in classrooms or on simulators? Another pilot who used to work at Boeing and has knowledge of the training requirements for the new 737-Max said avoiding a simulator-based training requirement for the new aircraft would have made it a much cheaper proposition for airlines. “The expense of having an iPad programme versus having to fly the pilots to a training facility and take them off shift is millions of dollars in additional training costs,” a former Boeing pilot told the BBC. The pilot, who has decades of flying experience, and has been an instructor, said that it is also down to airlines to establish how much additional training to give their pilots, beyond the minimum requirement set out by regulators. In its latest statement since the crash of flight ET302, Ethiopian Airlines has insisted that its pilots were trained on a 737-Max simulator. What is the minimum training required for a pilot to upgrade to the 737-Max? The Boeing 737 Max 8 is a new version of the popular Boeing 737-NG. The minimum training required for a pilot to upgrade to the new plane was established by Boeing, and signed-off by US regulators at the Federal Aviation Administration. When a pilot upgrades to a new model of aircraft it is known as “differences training”. In the case of the 737-Max the additional training can be done purely online. 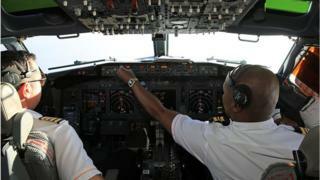 It is not compulsory for experienced 737 pilots to do any additional learning in a simulator. One pilot who works for a major European airline and has completed the extra training for flying the Max said the computer-based course took him about two hours. In a statement American Airlines, which also uses the plane, told the BBC: “Boeing 737-800 pilots were required to receive some additional training on the MAX 8, which included an hour lesson on some differences.